Kick-start or further your career as a professional commercial or literary translator! 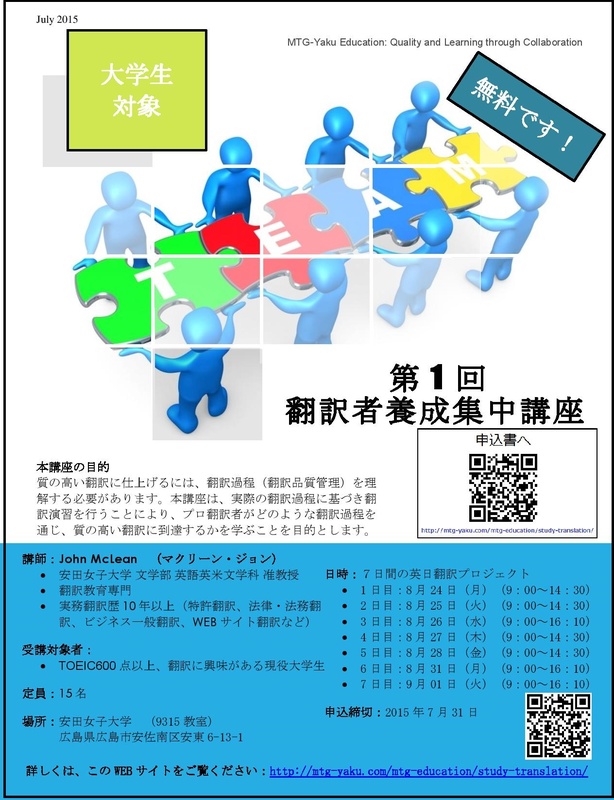 This Japanese-to-English translation programme is part of a movement to further understanding about how to equip Japanese-English language specialists with strategic and interpersonal skills/knowledge necessary to be able to pursue or enhance their careers as professional translators. The programme follows the ISO 17100 translation workflow and is informed by theory from the fields of translation, education, business and psychology. Over a period of 6 days, you will individually and collaboratively translate an extract from Yoshimeki Haruhiko’s Akutagawa Prize winning book, Sekiryōkōya under the guidance of the two programme tutors and the author, Yoshimeki Haruhiko, all of whom are university educators and experienced translators. The course is free for all participants who are willing to participate in the practice-based research project that underpins it. *Organizers plan to take a sample of outstanding translations produced over the duration of the course to a publisher for discussion. When and where will this programme be held? Willing to participate in the practice-based research project that underpins the programme. Native speakers of Japanese with fluent or near fluent English language skills (e.g. TOEIC 850+). What can you expect to learn on this programme? How to facilitate higher levels of intragroup functional conflict while mitigating intragroup/intrapersonal dysfunctional conflict. Who are the programme tutors? John McLean: John is an associate professor of translation studies at Yasuda Women’s University in Hiroshima, Japan. He has more than 10 years experience as a Japanese-English professional translator/interpreter and translation/interpreting project manager. He is currently preparing to lead a team of Japanese-English interpreters at the 2016 Rio Olympics. Makoto Miyagawa McLean: Makoto is an adjunct professor at Hiroshima City University and Graduate School. She has more than 10 years experience as a Japanese-English professional translator. Who is the guest speaker / source text author? Yoshimeki Haruhiko: Haruhiko is an accomplished author. He is best known in Japan for his book, Sekiryōkōya, which won the 109th (1993) Akutagawa Prize and was made into the movie, Yukie. He is a professor of Japanese literature at Yasuda Women’s University in Hiroshima, Japan. What is the objective of the research project that underpins this programme? Team performance—the team’s ability to produce a translation that meets stakeholders’ needs/expectations. Assess the impact of conflict on team members’ agency and team performance. Before deciding whether to participate in this programme and research project, please take time to read this Participant Information Sheet. What exactly will you do on this programme? Click on this link to see a provisional Timetable. What do you have to do in preparation for this programme? All participants need to purchase a copy of the source text, Yoshimeki Haruhiko’s Sekiryōkōya before the programme commences on 29th September 2016. Advice: If time permits, draft a translation of the first 10 pages before the programme commences. How much does it cost to register for this programme? This programme is free if you are willing to participate in the research project that underpins it. What about access, accommodation, food and drink? As this programme is underpinned by a research project, for ethical reasons, food and drink will not be provided free of charge. However, one of Yasuda’s convenience stores will be open until 3 p.m. on weekdays throughout the duration of the programme. Kinnunen, T., & Koskinen, K. (2010). Introduction. In T. Kinnunen & K. Koskinen (Eds. ), Translators’ agency (pp. 4-10). Tampere Studies in Language, Translation and Culture. Series B 4. Tampere: Tampere University Press.